At long last, a writer has given JKJ (or ‘Arry K. ‘Arry, as his contemporaries rudely dubbed him – “‘Arry”, as Oulton explains, being more or less on a par with “chav”) a decent biography. 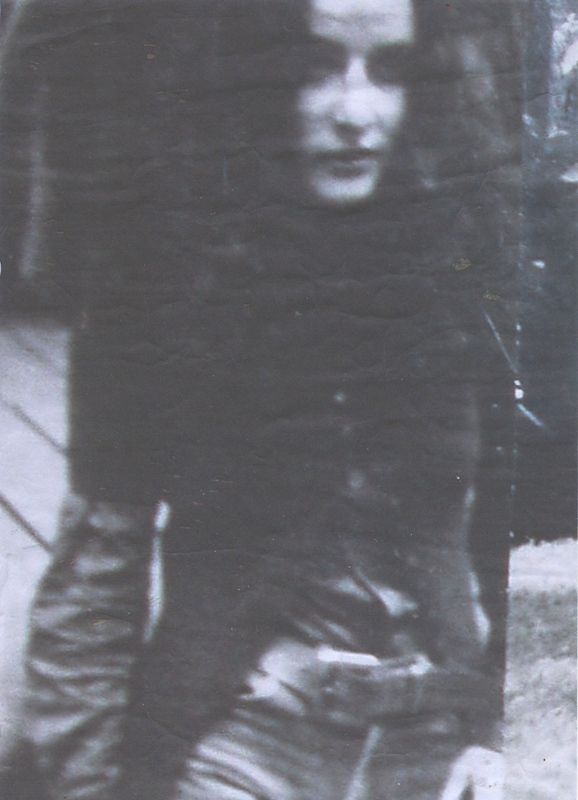 The earlier efforts have been hobbled by JKJ’s destruction of his own papers, and also by the way in which he concealed himself, either playfully or deliberately or even mistakenly, in his own autobiography. 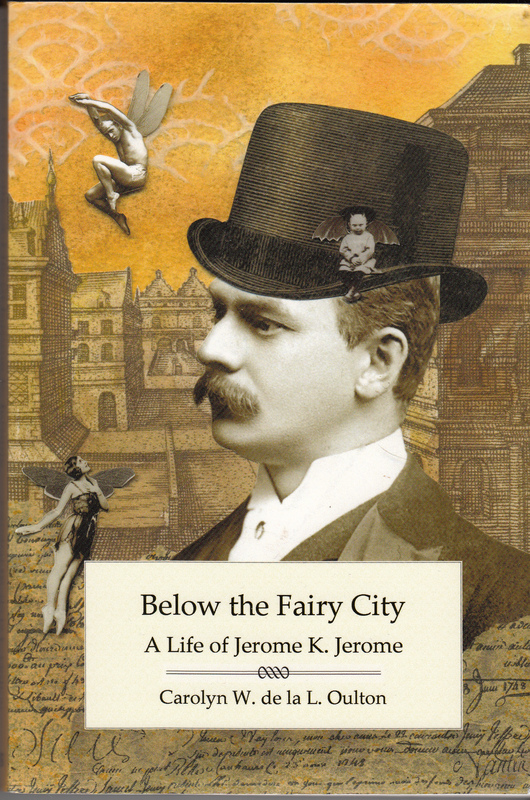 His name alone is a problem – He was certainly named Jerome Jerome, although his father was born Clapp, and changed it to Jerome not long before JKJ, his last child, was born (his previous biographer gets that completely the wrong way round). The middle ‘K’ disguises the fact that he (the son) was Jerome Clapp Jerome, something he was still admitting to census-takers and the like until well into the 1870s. The story he put round was that a Hungarian general called Klapka had been a family friend. There was a Klapka, but the dates are all wrong, and the connection is beyond implausible. Three Men In A Boat (Not To Mention The Dog) was perhaps a mixed blessing for Jerome, because it made his name and defined him as a comic writer (ironically, the book was intended as a sort of travelogue, offering glimpses of the history of the Thames, but a good editor, and good sense changed all that). Little of his other work was taken very seriously, although he did write a much-performed (and now little-known) play, The Passing Of The Third Floor Back. As a working journalist, however, he defined a new and entertaining style, and influenced a number of other writers, including Robert Lynd, the mainstay of New Statesman from 1913 to 1945, and who wrote for ‘Today’, one of JKJ’s magazines. Another, now-forgotten journalist, Gerald Gould, was also much influenced. Indeed, JKJ had a profound effect on the very magazine that took a critical cleaver to him more often than most: Punch. I first came across the oddity of Jerome’s life when I had the idea – about the only one that has ever attracted a publisher – of writing vignettes of a variety of figures in the 1881 census whose lives were becoming ‘lost’ – misunderstood, confused, subject to rumour. Quite often this was, it’s true, because the figures had tried to erase their footsteps, as Jerome did. I had a great two years, and then was swallowed by a job, and simply put the outcome up on the internet for anyone to have a go at. In Jerome’s case, it was the wonderful Frank Rodgers who set me straight (he is the fount of almost all Jerome wisdom, and what’s more, possesses Jerome’s mother’s diary). And if there is a family relationship to get tangled up in, it’s Jerome’s. I thought my own family had a stunner in that my great-grandfather’s cousin married her father’s brother-in-law. The Jeromes created a web of marriages and cousinry (no such word, but there should be) that it would take a genius to put it simply. Oulton, like me, has had Frank Rodgers on her case. He ticked me off very generously. Unlike me, she’s completed a full-scale biography. That curious Amazon trick of letting you read what feels like a lot of the book had the desired result: press Order Now. I didn’t regret it, and read the whole thing straight through. I really advise you to do the same. Do it here. It looked like another pizza advert, half-pushed through the door. 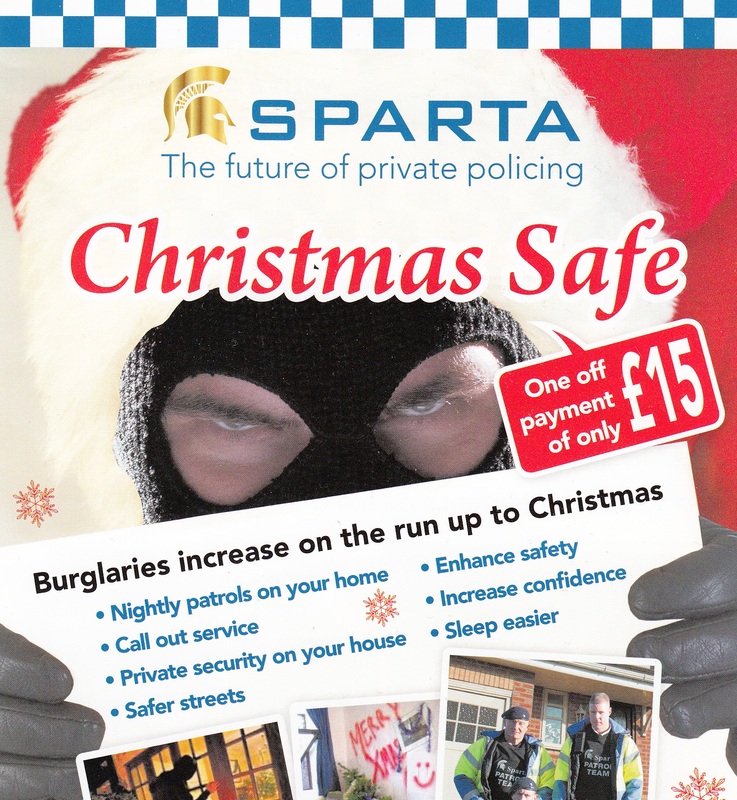 Yes, if I wanted guys in berets and bulletproof vests to be the ‘eyes and ears of the streets’, to ‘detain trespassers’, and to ‘enhance resident’s [sic] peace of mind’, I could get all this for £15. I am not quite sure whether the detention of trespassers is legal, but most things are. I wondered what they did. Came in and restrained your trespasser, and phoned the, er, police, I assume. A later part of the glossy leaflet does say they are in communication with the police, who possibly envy their thermal imaging, and training in Conflict Management. I don’t quite know how successful this is going to be. 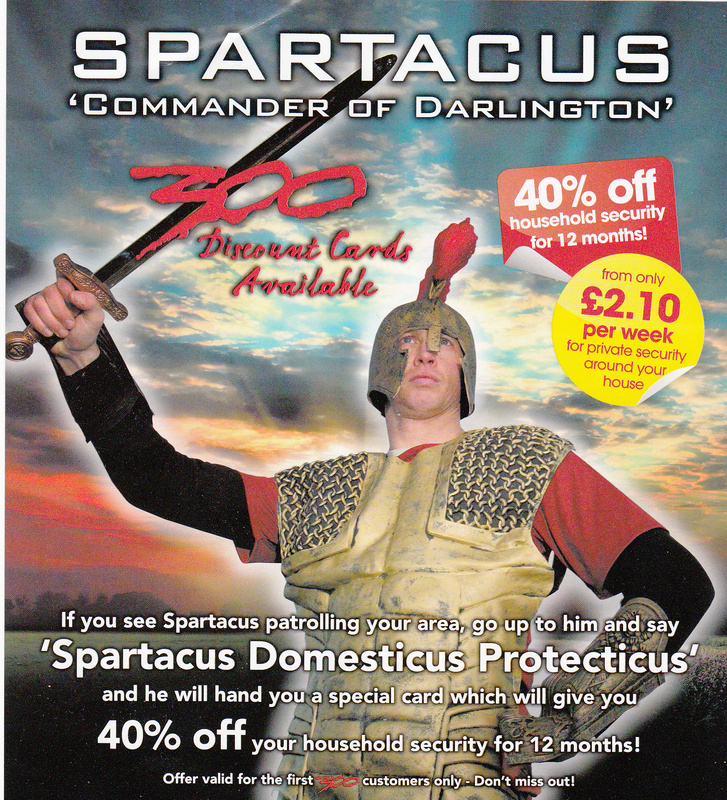 If there really is a man dressed up as a Roman centurion, all beefcake and slightly dicey padding, I find it hard to believe that anyone is going to go up to him and say ‘Spartacus Domesticus Protecticus’, in the hope that he will hand out a discount card. For one thing, if you try saying ‘Spartacus Domesticus Protecticus’, it is pretty hard to do it without exuding spit, and that’s a big sword he’s carrying. This is the kind of thing we need round here. I think I’ll go and check the door’s locked. The reporter does pretty well, all things considered. He gets the surname ‘Ord’ wrong (he has it as ‘Auld’); he doesn’t know which girl has not yet been found; and he doesn’t know Ethel’s first name. He does get the nicknames of the Ord sisters: Hannah is Hannah, but Genevieve is ‘Vevie’, and Winifred is ‘Winnie’. Nor are the details lurid, but they are of course sad, and a little sentimental – probably the two details he picks up on would now be treated with the same eye for detail, but with a lot less respect. The four girls had been collecting flowers: gathering primroses. Four bunches were found on the bank. They’d taken off their boots and stockings, and – although, as the reporter says, this is surmise – decided to test the water for a paddle. Did one slip, and the others try to rescue her? he asks. He also makes an illogical remark (well, I find it illogical): that they had not spent long on the bank, because, close to where the shoes and stockings were found, the name of one of the girls was found ‘written in the sand’. (This factoid is never repeated.) 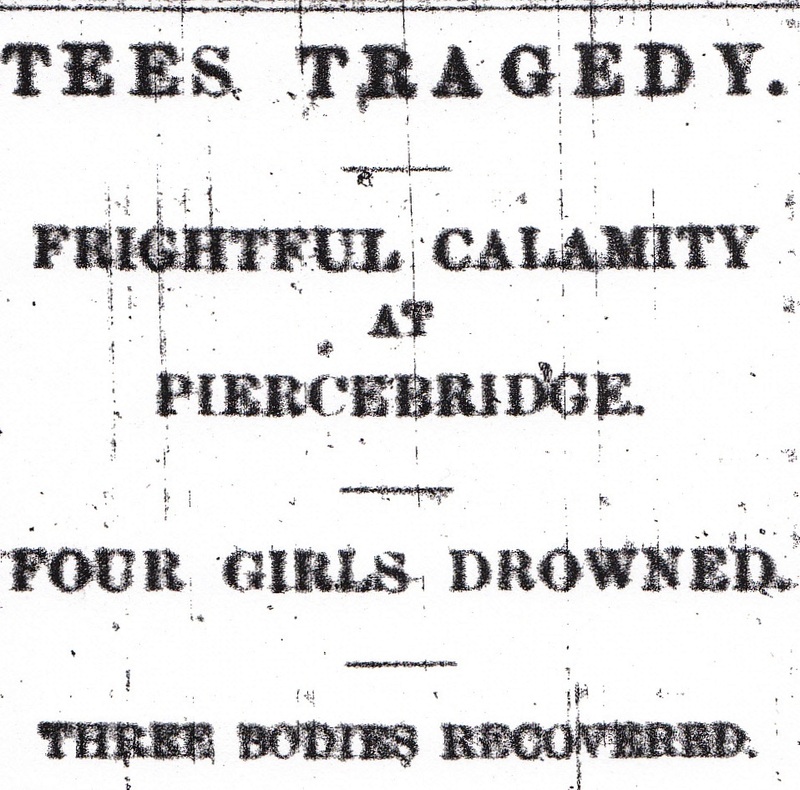 Two of the girls have been found in shallow water, but 600 yards from the shoes and stockings, in the Darlington direction; the other is 150 yards further on. It was finding the shoes and stockings that started the alarm, according to the reporter, although this story is to change. What subsequently turns out to be the true story is that a Colonel J.G.Williamson – not Wilson, as first reported – of Cliffe Hall, has been out for a late Sunday afternoon walk with a friend and two of his sons, when one of them, Maurice, has spotted a body. He and his brother have pulled it out, only to discover a second. And at this stage, the alarm is raised, the third body is found, and the search starts for the fourth (it is still going on late on Sunday evening, before being abandoned). In the meantime, Ethel’s father, who has been over to visit the Ords with his daughter, and has left her with them, has blithely gone homewards in a train – from Piercebridge Station, leaving at 8.30. This doesn’t fit with the suggestion that the alarm has been raised. He has been stopped before reaching home – either Whitby or Hartlepool, it never says, and I’m not clear – by a telegraph sent to Bank Top station. You have to say that this is all amazingly efficient. And that the fact that you could hop on a train at Piercebridge seems somehow admirable. I suppose a mobile phone call would have reached him more quickly, which would have been awful (he was informed of the drowning by a railway official, not by a random call). Always odd to contrast the technologies. 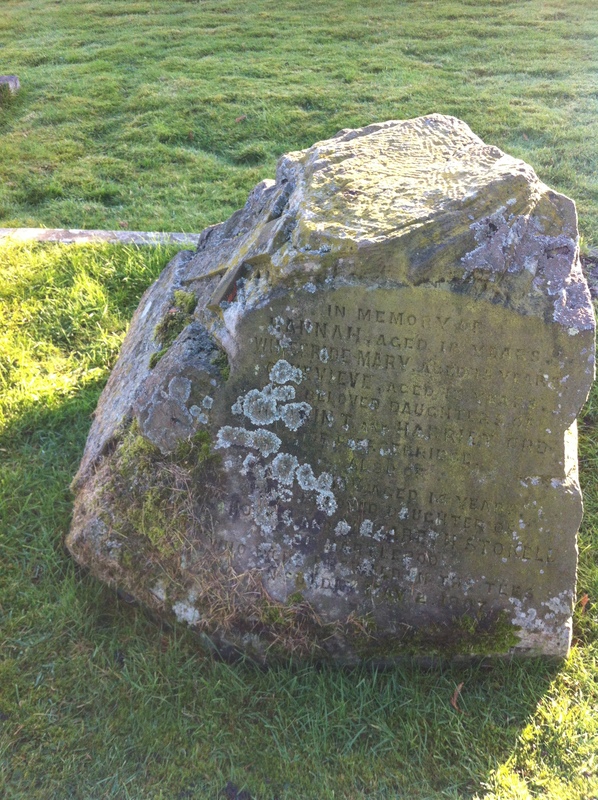 The bodies have been taken to a local farm (Low Fields Farm, the property of a Mr. Dickinson). The search for the missing fourth girl is resumed at first light on Monday, by which time, they know they’re looking for Hannah, the eldest. She isn’t found until three o’clock, ‘in a deep pool … close to a large rock’. By deep, about ten to twelve feet is meant. Grappling irons have been used in the search, but they don’t seem to have been used in the discovery. By the time Tuesday’s Northern Echo has reported this, the inquest is already fixed for Wednesday, at The Crown Inn, Piercebridge. Not surprisingly, Mr. and Mrs. Ord – particularly the former, who was in poor health, and who had only a year or two to live – were horribly distressed. ”The father and mother seem[ed] almost demented.’ They were spared having to identify the bodies, which were laid out upstairs, above the inquest – for viewing by the jury. Their bodies were unmarked, according to Annie Thoroughgood, who had laid them out. A young girl called Annie Graham says that she saw them at four o’clock, near Cliffe Hall, on the Durham side of the river. This in itself is odd, since the original reporter clearly says the boots and stockings were on the Yorkshire side. He may have been wrong, as this is never challenged. There is some speculation that they have walked along a stone shelf, when one has fallen into deep water; there is some speculation that they were thinking of crossing the river (the river incidentally had no footpath, something perhaps we take for granted). As the coroner remarks, the only thing they can say is that ‘these bodies have been found drowned, but … there is no evidence how it occurred’. The foreman assents. Two odd things turn up at the inquest – one is that Ethel Stokell has had 2s 8d (quite a lot for a 14-year-old!) on her, a silver ring, and a watch that had not stopped. The other is that only one pair of boots has actually been found, one additional boot, and five stockings. But to look into that mystery, relatives would need to be called, and the Coroner doesn’t wish to involve them. After this, the Northern Echo – preoccupied not only with the diamond jubilee of Queen Victoria, but also with a pit accident at Kelloe, and plenty of other incidents (the death of a young girl falling off a trap, as in pony and trap), moves on. The funeral is not mentioned. However, about a fortnight later, the members of the Victory Harmonic Social Club organise ‘a smoking concert’ – the Mayor in attendance – in Darlington, proceeds to the parents of the girls. (Actually, the parents were quite well off. Stokell owned houses in Hartlepool, and Ord had a reputation as a decorator and photographer, having originally been a hatter and mercer in Bishop Auckland.) It would be interesting to find photographs of the four. And also to find out what on earth a ‘smoking concert’ was (actually, this last bit proved to be easy. It was a musical concert only attended by men: rather odd, in the circumstances. The term is apparently still in use in obscure men-only circles). The Stokells were living in Whitby in 1891; they had two sons; he was a painter and brick manufacturer. 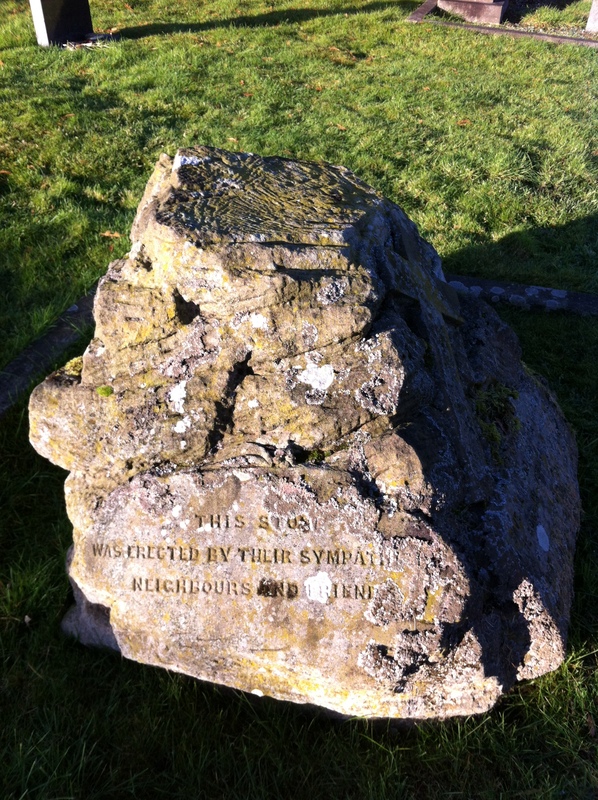 The younger son had died two years earlier (the elder survived till 1957). Ord was a photographer from Bishop Auckland; he had one elder and one younger daughter, and a younger son in 1891 (when they were living in Piercebridge). He died in 1899, aged 52. In 1901, Harriett Ord is still in Piercebridge, and is a poultry farmer. Her younger daughter and son are still with her. In 1911, she is still in Piercebridge, ‘of private means’. She is listed as having lost four of seven children. It is very odd that a tragedy like this has not slipped on to the internet. Ord – was his early death cause and effect? – was a photographer at a time when it is almost inconceivable that there will have been no photos taken of the girls. And the Northern Echo must have reported it (an inquest seems likely). So, to honour these poor lasses, I’ll keep at this one. I was driving back from Cumbria the other week, when I lost my way, not in a dangerous fashion, and besides, the scenery was beautiful. I just added thirty minutes to the trip. I went through Sedbergh, and only with an extreme effort of will (because it’s advertised as a book-town) stopped myself from parking up and losing every last penny in my pockets on new purchases. My bedside is stacked up enough as it is. The road brings you back to the road to Brough, which in turn, when you turn right, connects you to the A66, and so to Darlington. Where the road from Sedbergh joins up with the Brough road, there is a steep incline as you come to a junction. The road on which you are about to turn is quite heavy, in both directions, with traffic. In front of me on the road was a very long lorry, loaded with pale green girders. It was going to take some time for it to find a gap in the traffic. For a moment, unbidden, an image flashed into my head (I don’t know why) of a girder slipping off the back of the lorry, and passing through my windscreen and decapitating me. 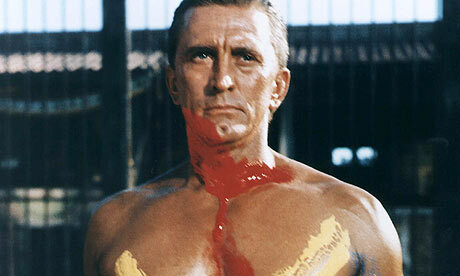 I don’t normally go in for these lurid daydreams. And anyway, a second thought erased the first. If I drew alongside the lorry (since there was space), I would not have to wait so long. When it made its lumbering break for the far side of the road, I would be able to sidle into its slipstream, rather than wait my turn at what would be by then the front of the queue. So I moved my hands on the wheel, and pulled over to its left. After five minutes (it seemed), the traffic did one of those coincidental both-way breaks, and the lorry found its gap. I duly drew out to the left of it, and slowly drew in behind it as it started to grind slowly into the distance. I was about thirty feet behind it, about to start on the journey east. And at that point, a girder did unfix itself, and crashed through the air towards my car. It landed in front of my car with a thump. I hit the brakes, but since I was hardly moving, this was easy. The girder landed six to nine inches in front of my bumper with a clatter. I got out to look at the car. I hadn’t heard anything, but it seemed possible that it had hit the front of my car, hit a light, hit a bumper, hit a tyre. But it hadn’t. The car behind me had squealed to a stop. I had to reverse a little to pull back out and round the lorry. The lorry-driver was too focused on the girder to do much more than wave vaguely at me. It wasn’t really till I was back on the road, maybe past Brough and on the A66, that I realised that, had I not pulled to the lorry’s side, I would probably have been driving right behind it when the girder detached itself (and its trajectory was the driver’s side of my car). I suppose there’s a bit too much in that ‘probably’. It was a strange evasion though: a moment of precognition. I saw what might happen, and it happened. Enough to make me wonder about how many different meanings there are to the word ‘luck’. Hazel – Haze – whose funeral it is today (Thursday), in this ice-cold world, died a fortnight ago. I can’t reach her funeral, but here is a poem for her. I’ve known her for the last 15 years – funny, straight-talking, a great mother to her son Will (now 18), a sun-lover, a laughter-lover, and a dancer sine qua non. 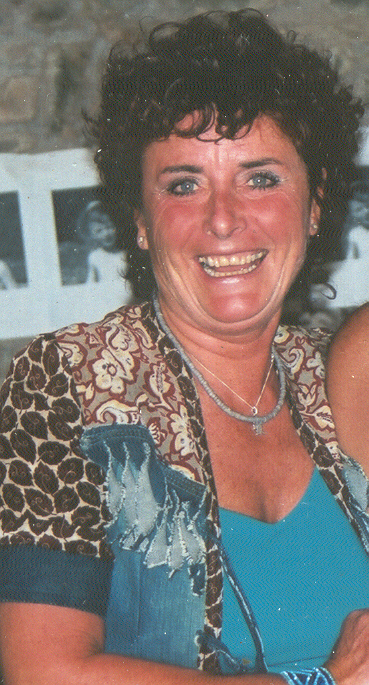 She was one of the first – perhaps the first dance teacher in schools in England, certainly in the Midlands. You knew when you met you’d get a great welcome. The one time she was hopelessly moody was when everyone ‘forgot’ her sixtieth birthday a couple of years back. She had an all-day sulk, before being driven, fed up, for a meal – but actually to a surprise party which dozens of people with whom she’d loved and laughed had kept secret. Not everyone likes surprise parties, but the mixture of howling tears and delighted laughter was wonderful to see. Her favourite expletive was ‘Eck. I built the poem out of her closest friends’ recollections. Hope you like it. instead of a shaker. And giving it by crikey. They think I’m doing that, eh? Well I ain’t. and a slab of Christmas cake, Wensleydale on one side. and everyone’s a daft ha’porth beside your style, your glamour. name you a perfume. Eau de Cologne? Oh no: it’s Eau Eck. and what’s the point when you ain’t with the ones you love? To pick each winning nation? We still salute you as a psychic. Lost titan of the world’s aquaria. As you leave us, grieving fools.